Welcome to the mid-way point of the Willow-Tree Month! Willows are wonderful trees. Growing beside rivers, ponds and lakes they carry with them the energy of flowing water, inspiring us to heal long-standing hurts and resolve outstanding issues. 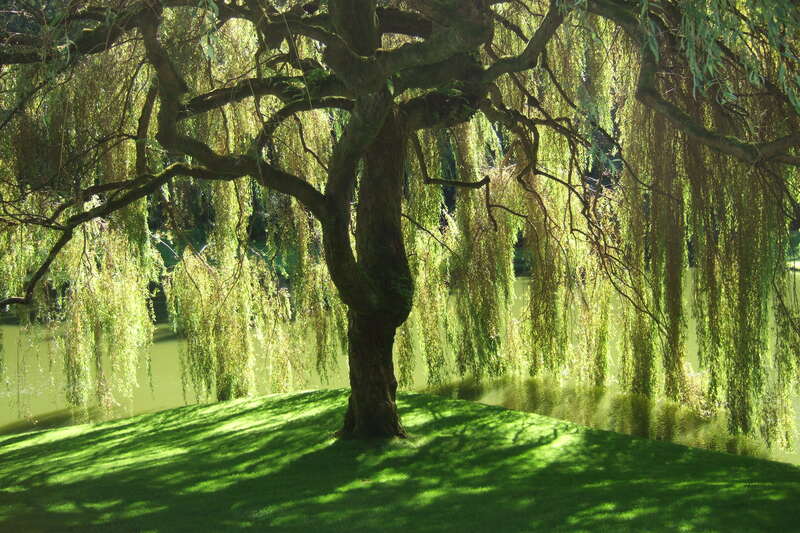 Of all the trees Willow is the Moon-Tree, the nurturing feminine aspect of nature. With its slender branches and quicksilver leaves it has held a special place over the ages in people’s hearts and minds and has been associated with birth and death, joy and sadness, poetry and love. The fourth letter in the Celtic Tree Ogham (an alphabet used by Irish druids many centuries ago) is Saille or “Willow”. 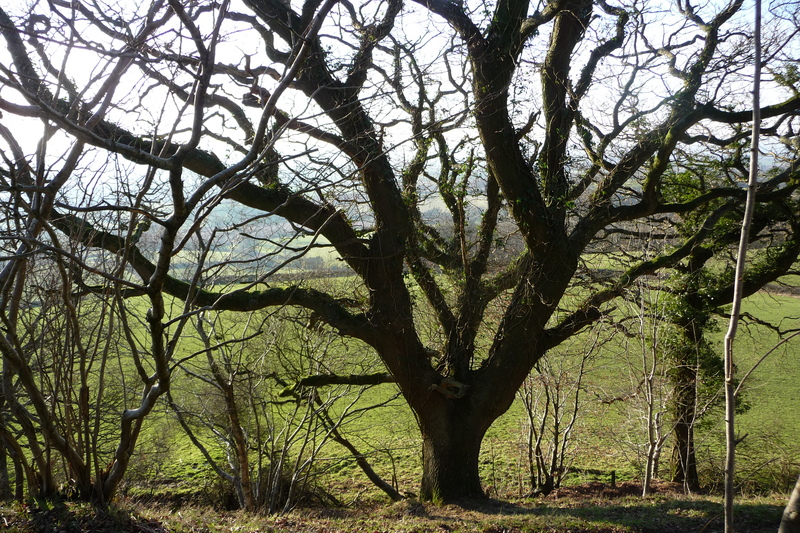 It sits between its cousin Alder (Fearn in the Ogham) and Ash (Nion). 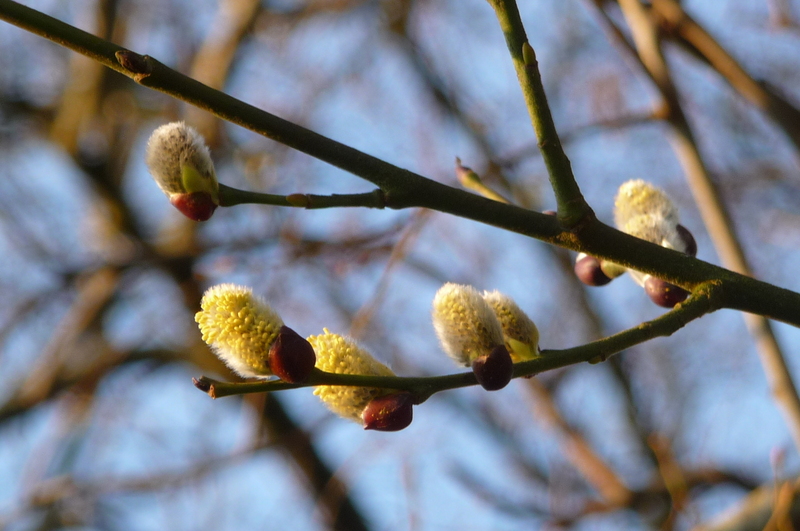 In the corresponding Celtic Calendar, the month of the Willow takes us from mid-March to the middle of April. It’s easy to see why. 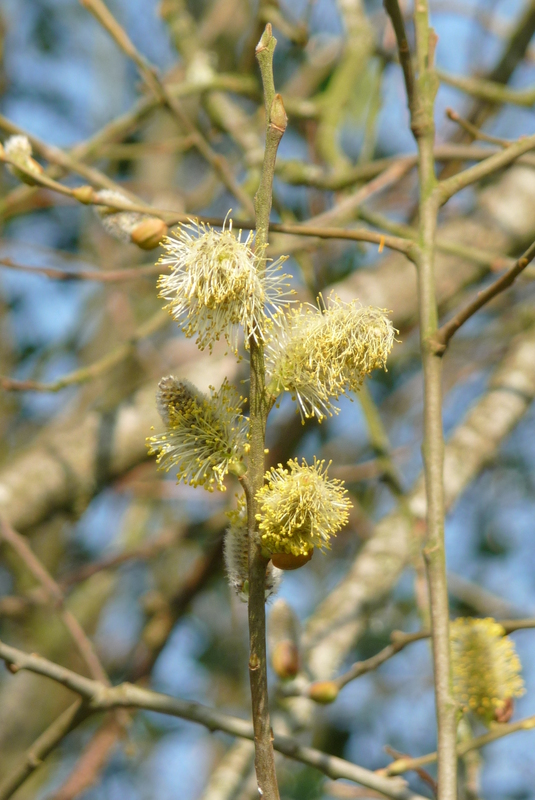 Few trees show much colour during March (other than the Alder, whose catkins have already faded), but the hedgerows here are festooned with the silvers, greens and golds of willows. Driving up and down England and Wales to attend recent book-signings has really shown me how much this elegant tree dominates the countryside at this time of year. 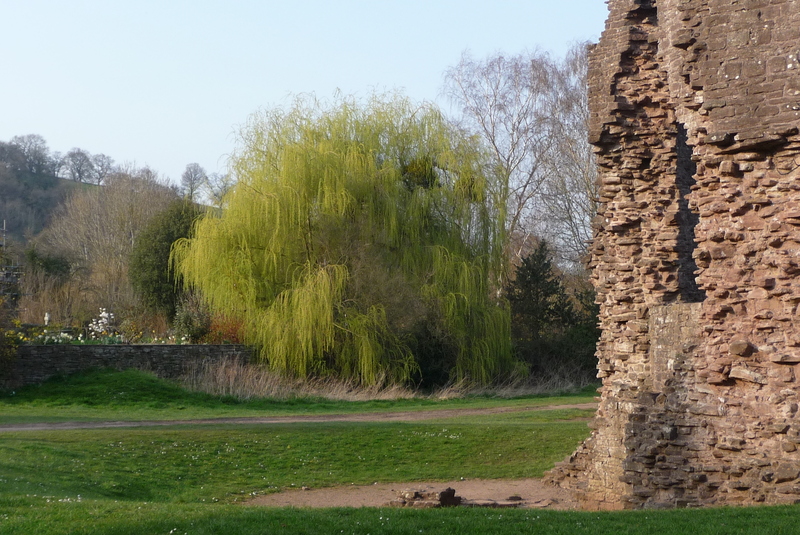 I took this picture of a Weeping Willow at Skenfrith Castle, which is one of the locations in Watchers. You can see how far ahead it is of the other trees. There are lots of different types of willow. White, Goat, Crack, Grey and Sallow are all native to Britain and Ireland (the Weeping Willow was imported from China as recently as the 18th century) and all varieties have much magic to share with you. Goat willows are most common in my neck of the woods. At this time of year they bear wonderfully soft catkins that are exquisitely soft to touch, like the new-born lamb that accompany them in the fields. 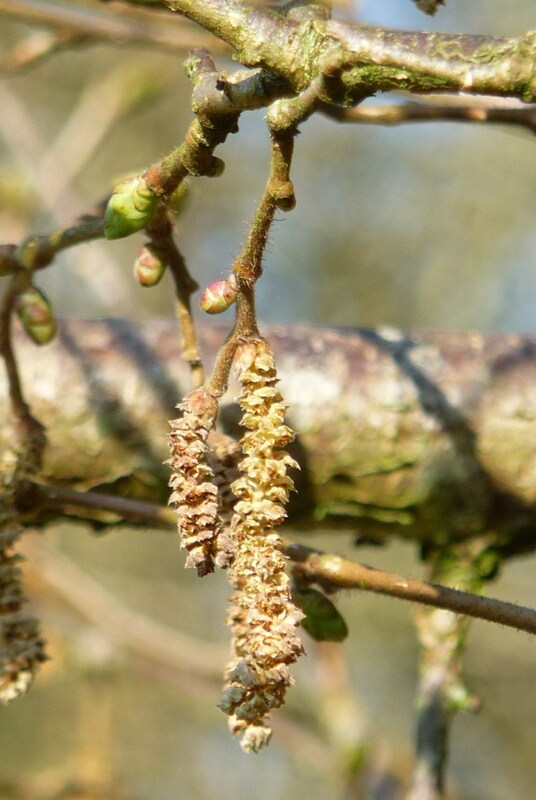 As their catkins open out, they transform from silver to gold. 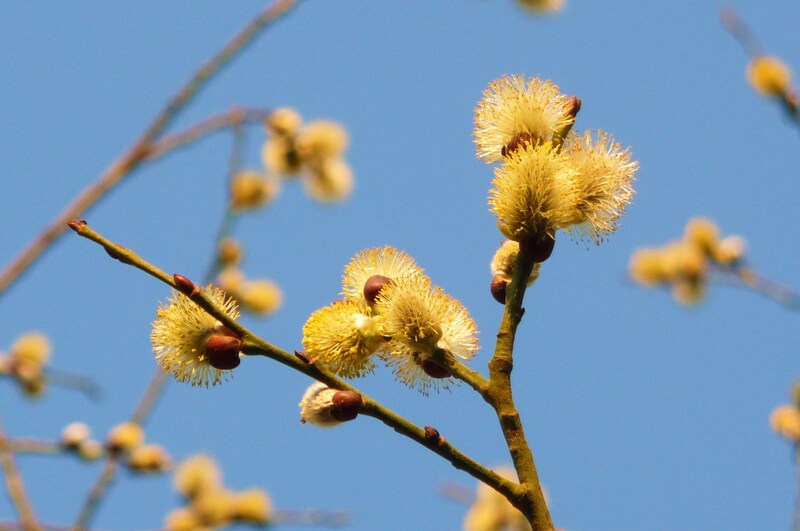 Druids especially valued the Goat Willow for this ability to transform from silver to gold, a kind of natural alchemy that they called “sunshine fire”. Looking at these ones, I can completely relate to that! Willows have been used in pagan festivals for centuries, gaining a place of honour both at Imbolc (Lady Day, sacred to Brigid) and Samhain. Because of its medicinal qualities, the tree was/is beloved by witches across the world – the wise women who are naturopaths and healers, rather than broomstick-riding “hags” – and in time it became sacred to Hecate herself. Willow is mentioned in the bible as a symbol both of joy and of death. 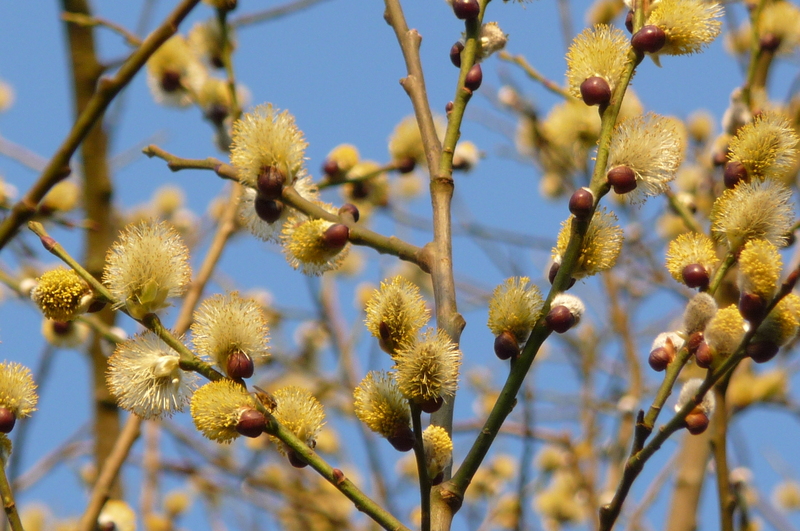 Until recently churchgoers in England and Ireland carried the leaves of the Goat Willow to church on Palm Sunday, which is why the tree is also called “Palm Willow”. Palm Sunday always falls within the Willow Month. Goat Willows were sacred to the Goddess Helice and it was to them that people went looking for inspiration. I can recommend this, especially when a gentle breeze ruffles the leaves; but be careful at this time of year…I sat under one recently and when I stood up I was covered in a fine dusting of gold pollen! The healing qualities of the willow are well-documented. A concoction made with the sap of white willow can be used to treat rheumatism, aches and pains and spots. Drunk as a bitter “tea” it is known to help with headaches and as a cure for diaorrhea! 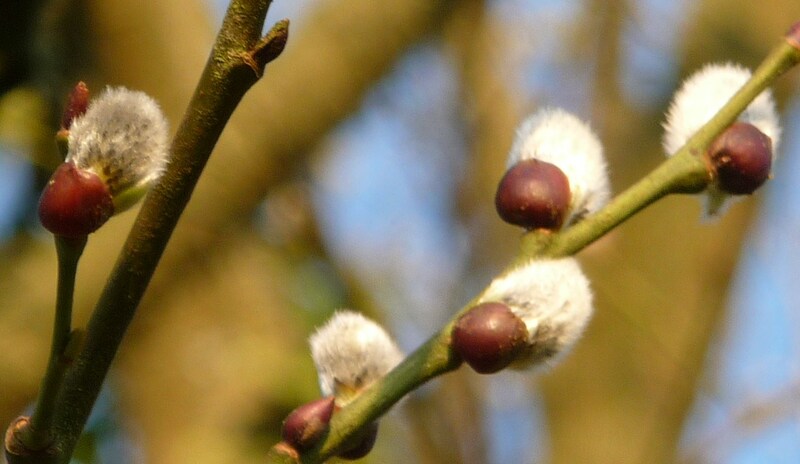 The bark of the White Willow contains salycillic acid, known as witch’s aspirin. The Weeping Willow is a beautiful tree, her branches often bending to the water whilst her roots trail below its surface. She has lessons for those of us who choose to listen. Spend an hour so sitting beneath a willow (preferably with a river or stream to one side) and let the sounds of the running water and the rustling leaves soothe both body and mind. It’s a perfect way to reconnect with the intuitive part of you, so often neglected by our teachers. 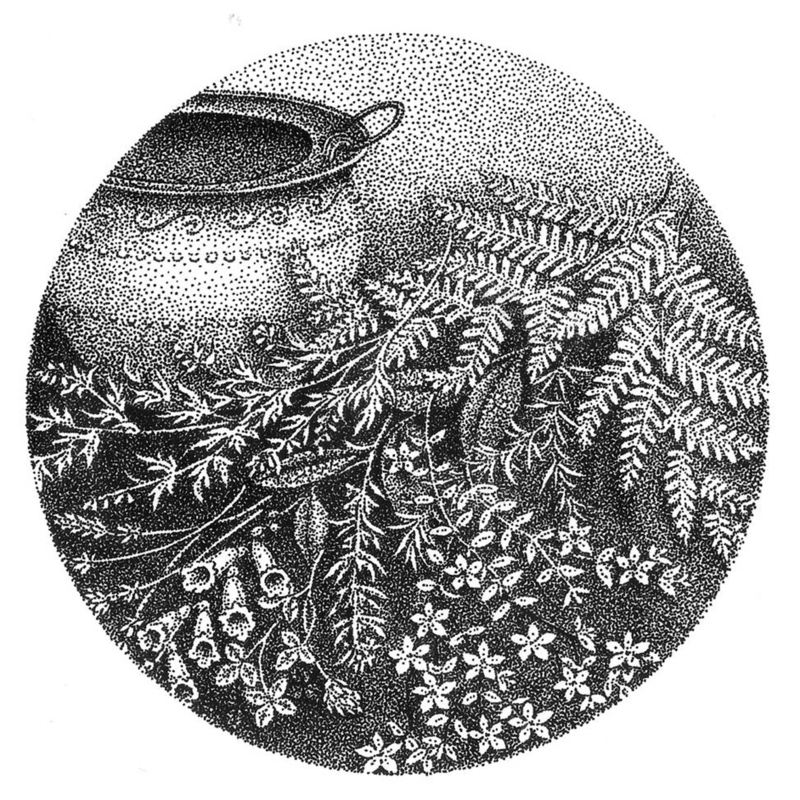 Were magic cauldrons woven from willow fronds? As a tree of divination (I’m told it makes excellent divining rods), willow is connected to dreams and prophecies. PS – If you enjoyed this post, I think you’ll enjoy the first book in my Tilly Greenway and the Secrets of the Ancient Keys series, which has a 5-star rating on amazon. Please see the links below. Thank you! Moon magic affects us all. Even when we’re shut up inside with the lights turned on, we still feel the pull that draws tides upon shores, the pulse of leylines weaving this way and that beneath our feet. We can’t escape it. At the centre of our brains, several tiny crystals of magnetite (our in-built Sat-Nav) ensure we are all just a little bit lunatic! This particular Full Moon looks both forward and back (perhaps it should be called the Janus Moon?) 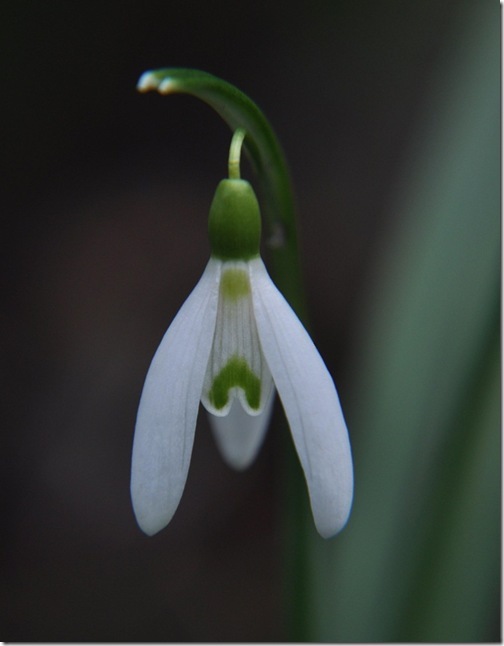 with one eye turned towards winter, another towards spring. Here are some of the names it has been given over the years: you can choose which one is most appropriate for you, depending on where you are in the world. In mediaeval England it was known as the Storm Moon. Elsewhere it was called The Bone Moon, The Little Famine Moon or The Snow Moon. All these describe the face that is turned towards midwinter, when chill winds blow and the earth is cold, when fingers are chilled to the bone and hunger hollows cheeks. Other names describe the face of the second Full Moon of the year that looks to the mellower airs of spring . In China it is known as The Budding Moon and the Dakota Sioux of North America call it The Moon When Trees Pop. I love that phrase! What a great way to describe what’s happening within the bark and sap of each tree right in those places where spring is already stirring. Fizz. Pop. Zing! To where the winds are blowing! And mountain streams are flowing! To the seas of purple heather! As we move from the old year to the new, here are some messages from the Yew, the Tree of Death, Rebirth and Everlasting Life. 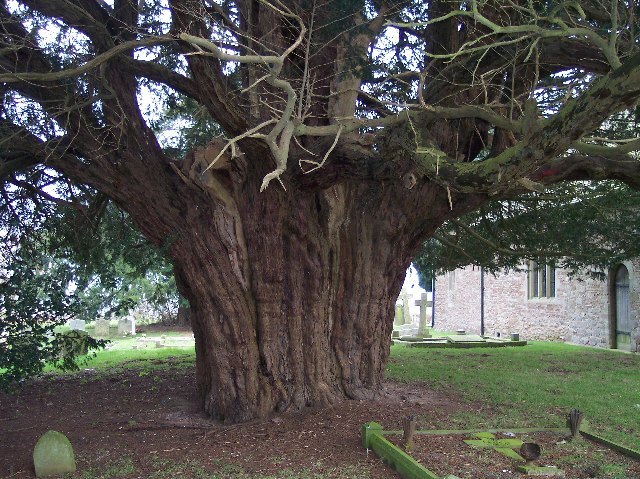 Oldest of all our trees, you’ll find many ancient yews growing near churches, usually on the north side. No one is quite sure how long they can live, but we do know that some are several thousand years old. So they have much wisdom to impart. Yews are unusual in that they can reproduce by allowing their branches to sweep to the ground. Where they touch it, a new tree will spring up, each one connected to the other. They can also grow up from “within themselves”, a new trunk emerging from within the husk of the old. So it is not surprising that they have long been revered as living emblems both of the interconnection of all things and of the endless cycle of birth, life, death and rebirth. They can literally resurrect themselves. Our ancestors often chose for their sacred sites places where Yews were growing. If there were none nearby, they planted Yews in places where they wished to worship (see my last post for more on sacred sites), most churchyard Yews being far, far older than the buildings that have sprung up beside them. Why the north door? Look inside the north door of churches and you’ll often find an old pagan image of some kind carved into the stone above it: a green man, or a sheaf of corn. These were put up in order to pay tribute to the old ways. The north door was “the devil’s door”: not because evil things lurked outside, but because it represented an acknowledgement of the power of nature, the call of the wild, which The Church wished to demonize. When the early missionaries were sent to “convert” Britain, the pope urged them to use the old places of worship as their own and to appropriate existing religious days as holy-days. Hence the midwinter Feast of the Unconquered Sun became Christmas, the Feast of the Unconquered Son and the spring Festival of Eostre, goddess of the dawn, became Easter, the date of Christ’s resurrection. It was a smart move, helping The Church to take a hold in a way that it might not have done. But the old traditions have great sticking power and they still won’t let go! Even today we collect Holly, Ivy and Mistletoe at Christmas: the evergreens valued so highly by the druids and many before them! The word Yew comes from the Anglo-Saxon “Giuli” which is the stem for our word “Yule”, the time when the wheel of the year turns from old to new. In the Celtic Calendar, the Yew Tree sat at this turning point on the wheel, where the old year became a new one. The Yule Log was originally a piece of Yew. Set on the hearth, it burned for 12 days over the midwinter season, spanning this time of change. Yew wood is hard, bright orange and has a heady scent. Once treated, it is almost impossible to damage it, so it has long been regarded as a symbol of everlasting life. At the same time it is also known across Europe as The Death-Tree. Perhaps this is because its bark, foliage and fruit are all poisonous. Birds will eat the red flesh of the berries, but not the stones. Death and Everlasting Life walk hand in hand in the Yew Tree. In Ancient Irish lore, the Yew Tree was one of the Five Magical Trees and was sacred to Banbha, the death-aspect of the once-supreme Triple Goddess. In Britain it was also associated with Hecate and so is dear to witches. Shakespeare calls the Yew “twice-fatal” and chose its juice as the poison which Hamlet’s uncle pours into the king’s ear in order to bump him off. So, it is a tree with quite a reputation! Famous as the wood from which English bows were made (another association with death), Yew was also favoured by druids for making ogham-sticks and for their staves. My guess is that Gandalf’s staff would have been of Yew. 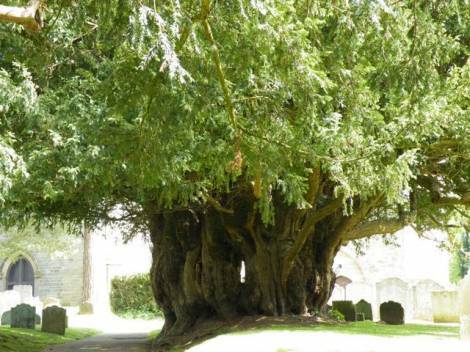 With their long association with both death and rebirth, Yew Trees give us a timely reminder at this time of year of our contact with the spirit world and with our ancestors. One Old Belief that I particularly like is that the roots of churchyard Yews intermingle with each other and reach into the mouths of those who are buried there, giving voice to the spirits. It is said that this accounts for the reddish colour of the bark as well as the berries. I once lived near a small wood made up entirely of Yew Trees. I would crawl under the branches of the outer trees and then stand up and walk inside a world that was hushed and dim, but never frightening. Sometimes I would sit propped up against the trunk of the oldest tree, listening to the whisperings of root and branch and twig. As the Tree of New Year’s Eve, the message of the Yew is for us to live life and enjoy it, to waste not an instant of our brief time here. Yet it holds a deeper message too. It tells us that death need hold no fear over us, but is itself a birth, a moment of transformation. Just as the Yew can spring up from its own dying remains, the old year passes away to be replaced by a new one that would not be the same without those that came before it and those that are to follow. And just as each Yew Tree is connected to the next, so all moments in time are linked. Our lives are the same. We would not be who we are without our ancestors and we in turn will be ancestors to our descendants. Nothing truly ends and nothing is truly separate from anything else. Long after we are not here to sit in person beneath its boughs, the Yew Tree will be singing its song, whispering the tales of eternal spirits to those who wish to listen. Wishing you a wonderful, enchanted and dream-filled 2012! PS – If you enjoyed this post, you might enjoy my book Tilly Greenway and the Secrets of the Ancient Keys, which includes a lot of old Tree Lore. Fin out more at any of these links. Thank you! The world of Tilly Greenway and the Secrets of the Ancient Keys is not like any other. Yes, it is a tale of fantasy and magic, but whilst there are mythical creatures and others that you might think are “made up”, the action takes place in the real world and is very much of our time. I wanted to contrast the two worlds – real and imagined – but also to link them through actual places that you can visit. 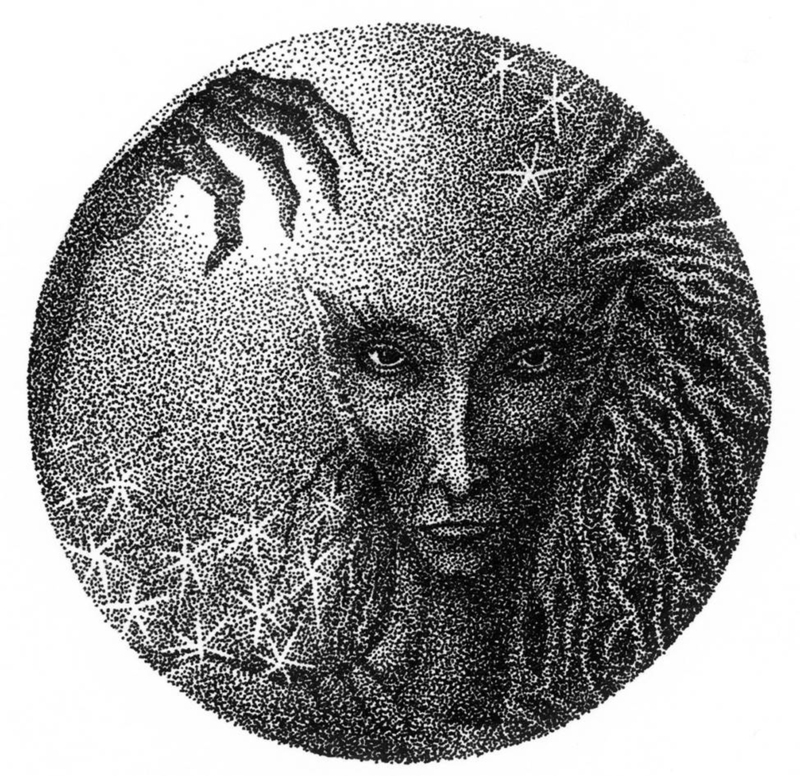 Myths and legends often grow up around a particular place because that place holds some unique resonance for people. Often this resonance is to do with magnetic lines under the earth or water courses of some sort, which is why so many sacred sites are either where two leylines cross, or on the bend or a river or stream. The names of these places still refer back to stories that are now only part of folklore, but which used to be regarded as true. For instance, there is a place in Wales called Dol-y-Carrog, which means “Hill of the Monster” in Welsh, so I used this as one of the locations where the last 12 dragons are lying in wait for the time when the world is facing imminent tragedy, when they will be woken so that they can fly to the rescue! Another resting place for one of the dragons is Silbury Hill, which (in the story) is named after a dragon called Yggdrasil, the Ash Tree Dragon. Yggdrasil is sleeping soundly beneath the ancient dome of Silbury Hill, which used to be called “Yggdrasil-Bury-Hill” as a result, but which in time has been abbreviated to “Silbury Hill”. Of course, this is pure fiction on my part – but the fact is that Silbury Hill and the Stones of Avebury DO align with the constellation Draconis, or Dragon, in the night sky. On top of that, the hill itself hides a step pyramid as old as those in Sakkara in Egypt…which is important to the plot of the books. I love this blending of an entirely imagined/fictitious world with that which is right under our noses. For me, it’s one of the things that keeps real magic very much alive and kicking. In Book One, Watchers, Tilly and her stepbrother Zack visit a number of Sacred Sites in the UK. These include Glastonbury, The Chalice Well Gardens, Silbury Hill, the West Kennet Long Barrow, Old Winchester Hill and the Avebury Stones. Part of the fun of reading the story is that you can visit these places, find out more about them, connect with sites that our ancestors regarded as special (and which many of us still do). 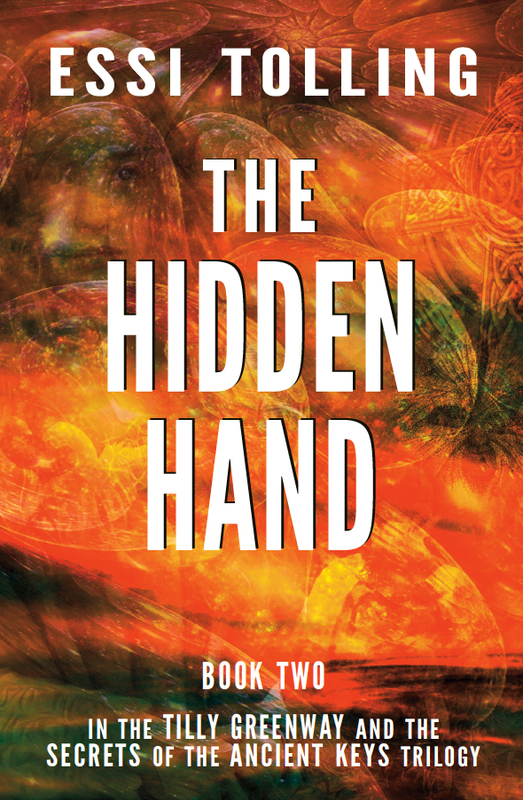 In the rest of the books (starting with The Hidden Hand) you’ll find out about a lot more sacred sites in different countries as the search for the mysterious ME Keys takes Tilly and Zack further afield. I hope you enjoy visiting them as much as I do! As day gave way to dusk last night, two ravens came tumbling down the valley. They flew in a broad arc, cutting through the air, diving and twisting as they chased each other until they passed right over my head and disappeared into the twilight. Ravens at dusk: always a sign that magic is at hand, but even more powerful when seen on the eve of the Winter Solstice. Raven magic is deep, old magic. The Raven is a harbinger of many messages. It is a bird long associated with magicians and enchantresses. And it is at its most powerful at the Winter Solstice, when the darkest day of the year matches the bird’s dark plumage. Ravens appear in myths and legends all over the world. Sometimes they are the tricksters, sometimes they are omens of a coming death, but more often they speak simply of change and birth. It was the raven that Noah sent out from the Ark after the waters had begun to subside. That bird never returned. But it was also a raven that fed the prophet Elijah when he was hiding from King Ahab. In Celtic lore the Raven is associated with the god Bran, who in turn is associated with the cycles of life and the seasons through his ownership of a wondrous cauldron that could bring the dead back to life. This was the very same cauldron that was once owned by the White Goddess, Cerridwen…but that’s a story for another time! Bran is linked with the Tower of London (his one-eyed head was supposed to have found its resting place there) and the old superstition that ravens must live at the Tower if the country of Albion/England is not to fall prey to invaders is still very much alive. To this day you’ll see plenty of ravens there, as well as Beefeaters! Most ravens are black and black is the colour of creation, for it is from darkness that all life springs. Black is the colour of the sacred feminine, representing the primordial soup from which life first began, the yin of the yin/yang balance, the black holes that surround us in the universe and are a part of our own cells. When you see a Raven, take note that mysticism and magic are calling you in equal measure. The Norse god Odin had two ravens as his messengers. Their names were Hugin (thought) and Munin (memory). Odin himself was a shape-shifter who could turn himself into a raven when he wished to. Ravens are honoured in the tales of the Africa and Asia, as well as in the totem poles of North American Indians. The bird’s black feathers gleam with every colour under the sun and moon, showing us that light can be brought forth from darkness – perhaps the most important lesson of all on this particular day of the year. When Raven makes an appearance in your life, learn from its ability to be both wary (ravens will disappear quickly and quietly when necessary) and its ability to stand tall and not be intimidated by life. Listen to the messages from its voice, which is one of the most versatile in the animal kingdom. It is saying to you that you can go into the void of darkness and bring forth whatever life you choose. You can stir the primordial cauldron to create the sustenance you desire. Each of us is magician and enchantress: so says the raven. Each of us shifts shape as we go through life. Each of us has the ability to create form from the unformed. Today is the shortest day of the year (in the northern hemisphere), the day when darkness has its greatest power. Yet it is the day when we begin the shift towards light, too, inexorably drawn back on the wheel of seasons towards the time when light and warmth will play their part. As each day passes, a little more light is drawn from the wings of darkness. And soon the summer will be here. Raven teaches us that we are instrumental in this process, that we can each of us bring forth light from dark: that we are all creators. Raven also teaches us to celebrate the darkness, for without it no candle would shed light, nor would the stars gleam so brightly in the night sky. Enjoy your Solstice celebrations and if Raven appears for you, listen well!